Banner ad for Neopets Mobile. Neopets Mobile was a service launched by the website Neopets in partnership with T-Mobile. The service lasted from June 28th, 2006 to June 30th, 2009. When Neopets Mobile was announced, the service was overshadowed by its features rather than the promise of Neopets being on a mobile phone. In its announcement, the only thing mentioned is the newer pet at the time, the Lutari, and the Lutari Island which was exclusive to Neopets Mobile. Quest from Briana the Air Faerie: The quest you would obtain from Briana were quite rare, most would involve you obtaining an item for her. In return, she would reward you with a rare item and Neopoints. Wheel of Happiness: A clone of the Wheel Of Excitement attraction on the website. The Wheel Of Happiness was exclusive to Lutari Island, it was a simple activity which involved spinning a wheel to either unlock events or win various prizes. The time for each play was limited to 30 minutes per play, meaning after you spin one round, you'd have to wait 30 minutes to spin again. 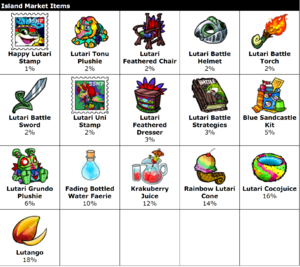 Island Market: The only shop on Lutari Island. You could buy Lutari Island exclusive trinkets there. Now that the Neopets Mobile service is discontinued, the items are now unavailable for purchase on the regular Neopets Market. Now unavailable Island Market exclusive items. Bog of Charity: Lutari Island's clone of The Money Tree. Just like with The Money Tree, you could go up and pick up random free items. Fluorescent Pools: Lutari Island's clone of The Healing Springs, where you would heal your pets at a fountain. Lutari Savings Bank: Lutari Island's own bank, made since it was far off from the rest of Neopia. Like the regular bank, you can deposit, withdrawal, and collect bank interest there. Island Gossip: Text-only clone of "New Features", the place that explained new additions to the site. Survival Academy: Lutari Island's version of pet training, a place where you would train your pet while surfing the site. Payment for the training was by Lutari Feathers, which are easily obtainable throughout the island. To keep the training going, you'd have to keep the game running. The training would automatically end if the game was quit or if the phone was shut off. Blockstravaganza: A Tetris clone exclusive to Neopets Mobile. The objective was similar to Tetris, which was to line up three similarly colored blocks. Go Go Lutari! : A game based on the already existing game on the Neopets site Turmac Roll, where you would control a rolling Turmac, bouncing on stumps and collecting fruit. The only difference being that the Blue Lutari you played as could jump on stumps and even double jump to reach high items. On June 30th, 2009 with the incoming market of 3G phones like iPhones, WAP-enabled cell phones were becoming obsolete, Viacom (Neopets’ then owners) decided to shut down the Neopets Mobile service to all players. After Neopets Mobile was shut down the Lutari Island went away with it. The only remaining evidence of its existence is a page on the main website, where you can see the island through a cloud of fog, though it is inaccessible.